As a working mother, Karen Coty had real concerns when her doctor told her she needed surgery. “I had been having pains, cramping, so my OB-GYN Dr. Katrin Arnolds, ordered an ultrasound. 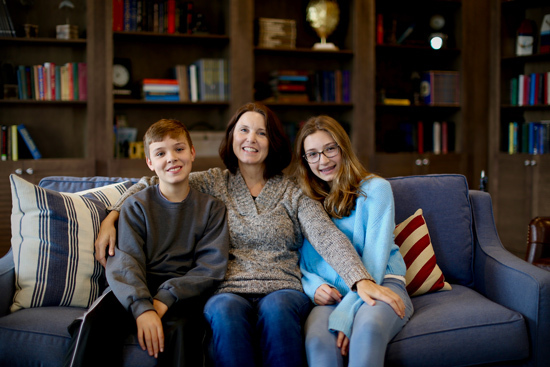 The results showed I would need to have a hysterectomy,” recalls Karen, a single mom who is raising 13-year-old twins and also teaches full-time in Georgetown. Karen’s uterus was enlarged and she had pre-cancerous cells that concerned her doctor. 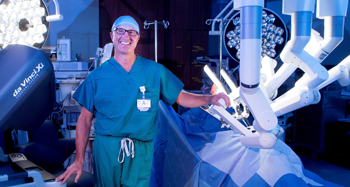 Dr. Arnolds of Beebe Women’s Healthcare – Plantations completed fellowship training in minimally invasive gynecologic surgery at the Cleveland Clinic and is certified to operate the da Vinci robotic surgical system. “When Karen explained that she couldn’t take too much time off from work and from being there for her young children, I knew we could help her,” said Dr. Arnolds. “The great thing about robotic surgery for patients is that they have a shorter recovery time. The incisions made by the surgeon operating the robot are much smaller, meaning faster healing and less time in the hospital,” Dr. Arnolds added. Learn About Beebe's Center for Robotic Surgery. Karen went in for surgery where Dr. Arnolds was able to remove her uterus and examine Karen’s other organs for possible cancers. Finding no other pre-cancerous cells, Dr. Arnolds was able to drain a cyst, but leave the ovaries intact. “When I woke up, I felt like I had a hangover, but the team was so positive. They got me up and moving. My mom was there and I was headed home by 1:30 that afternoon,” Karen said. For a traditional hysterectomy, patients are often recovering for months. Even with minimally invasive techniques, recovery can last several weeks. For Karen, she was able to take about a week off of work and be with her kids throughout her recovery. “Each patient is different, so not everyone will be right for robotic surgery. There are benefits for patients like Karen, whose main goal was to be at home with her kids, but it is a conversation patients need to have with their physicians – to determine what type of surgery is best for them,” said Dr. Arnolds. Learn more about Beebe’s Center for Robotic Surgery: www.beebehealthcare.org/robotic-surgery.